Susana turns dressing into an art form. She starts each of her outfits with a description of her creative process and is very descriptive of how she came to a certain outfit. Learn the difference of being creative and innovative and take your dressing and style to a new level. Let’s discover how! Certainly. I was born in Venezuela, but my entire family is from Spain, so we left when I finished high school and moved to Spain, where my home is. I came to the United States to finish my university degree, and was offered a job when I graduated, so now I pretty much live here, although I go back home to Spain at least once a year. I have worked on television, as well as in public relations and advertising. The largest part of my professional life was spent as a higher education administrator, working for different universities in fundraising and development, as well as student affairs, career planning, etc. For the past seven years, I’ve been a graduate and MBA professor of leadership in a School of Business, which is why I feature so many work appropriate outfits on the blog. I have no problem sharing my age! I am 43 years old. I think everyone should own their age! Can you tell us a bit more about your blog A key to the Armoire and why you created it? I have always been interested in fashion, but most of all, in personal style as a means of communication. What we wear says a lot about whom we are, what we care about, and what we value, so it is a very important communication tool. I have always been baffled by the dichotomy of people saying that they want to be “unique” or “one of a kind”, and jump at the first opportunity to dress “like everyone else” or buy “the latest IT whatever”. I never wanted to be like that. I never really cared about how other people dressed, I simply wanted to dress the person I was. Once I started working, especially in higher education, people often asked me for advice about dressing professionally, so the idea of possibly helping others to see their closet (or themselves!) in a different light was definitely a motivation behind it. Also, I am a very big fan of Thomas Jefferson, and I had always been fascinated by his dedication to chronicling his daily, seemingly unimportant home life. I thought it would be very interesting to do something like that with what I truly wear day in and day out. It’s kind of a diary of my own personal style development. I wanted to share with people how you ALWAYS have something to wear, and that you don’t need to shop for new things all the time to look good. I would describe my style as an outlet for who I am and what I feel every day, so it varies a little, but overall, I would say that it tends to be feminine and ladylike, a bit preppy at times, and always classic. I do enjoy contrasts, so adding feminine touches to a menswear-inspired outfit is always a favorite for me. I love how you describe your styling process with each outfit. What is your most common starting point and why? I would not know what to answer with regards to my most common starting point because it truly depends. 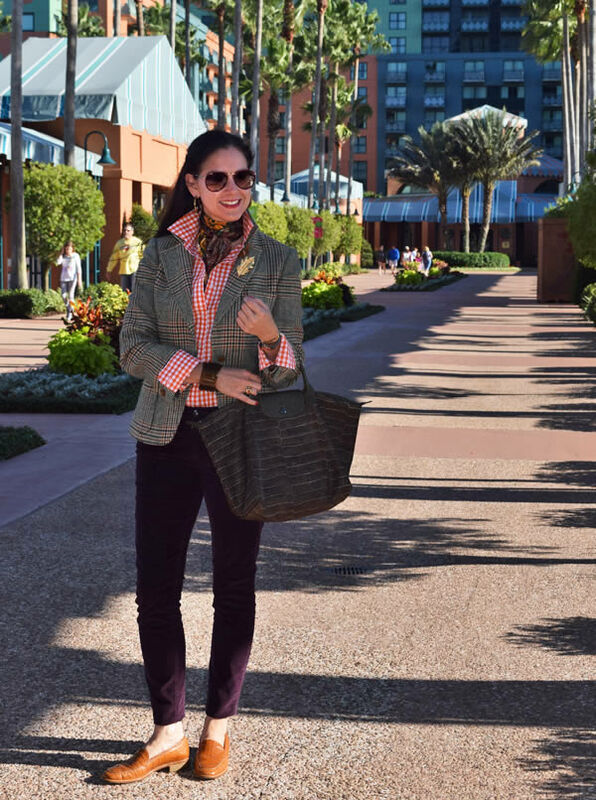 Sometimes I am inspired to start an outfit from a feeling or an event, while other times, I may start from the color combination of a silk scarf or the texture of a shoe. Yet other times, I may start from a new piece I bought or one I haven’t worn in a long time. I also get inspired by a silhouette and, from there, start building the outfit with what I have already. By the way, I’m so happy that you enjoy the styling process I include in the posts! When I started doing it, I thought some people would enjoy reading about how I put together the outfits, and possibly start getting inspired themselves to explore their own process. Probably being innovative in how I approach the pieces in my armoire. Being creative is great, but I value being innovative a lot more. Most people don’t know the difference between the two. Both processes need creativity, but being creative means coming up with something that has never been done before. Innovation, on the other hand, is taking something that already exists and changing it to make it better. It is a concept I teach in business school, but it also applies to something as mundane as a closet. Most women stand in front of it and say: “I have nothing to wear” even though they are standing in front of hundreds of things. What happens is that most of us buy something, wear it once in a particular way, and have a hard time “seeing” it styled in any other way. That’s because creativity comes easier, and also because we associate certain “states of mind” or “feelings” with our pieces of clothing, so we find it hard to assign different ones to them the second time around. Innovation requires applying creativity within limitation (what you already have around), so forcing yourself to seeing those pieces in different combinations encourages you to become innovative within your own closet. That’s why I always link back to how I have styled a piece before, so that readers can see its possibilities. The second aspect that I consider quite important with regards to style is knowing yourself and the occasion for which you are dressing. It doesn’t matter how fabulous your outfit is, if it isn’t YOU, you’ll feel (and be seen) as if you are wearing a costume. Even if you are dressing for a particular occasion, find within yourself how YOU would feel comfortable in that situation, and wear that. It doesn’t mean that if you’re most comfortable as a beach bum, that you will wear flip-flops to a job interview, but that you will find a sportier version that fits you and is still situation-appropriate. I live in South Florida, in the United States. Most people think of Miami as warm year-round, and it is, for the most part. We don’t get a whole lot of extremes around here. When the rest of the country is experiencing scorching conditions, we are in the mid-seventies, and when the rest of the country is experiencing tundra conditions, we probably are experiencing our “Florida winter”, which is low-sixties or fifties. This means that I can wear pretty much everything save coats! I always laugh when I go to Spain and it’s maybe the same temperature we are having in Florida, let’s say, in Spring, and people there are wearing coats and scarves, but in Florida, even if you freeze, you CANNOT be seen in a scarf because…we’re in Florida for goodness sake! So people still freeze, but in flip-flops! It cracks me up! On a more serious note, this becomes more important when I travel. I try to understand the dressing culture of the place I visit and adapt accordingly, but again, while always honoring my own style. I’m not sure. I guess that would be for others to say. This question reminds me of a co-worker who was looking at a picture of me as a child. She looked at it and said “Oh, look it’s Susana wearing the same clothes, but smaller!” I almost died laughing! It was spot on. I have always veered towards classic clothing, except that one time in high school when I REALLY wanted paint-splattered jeans… Overall, I think my signature style is attempting to reflect kindness and elegance through my outfits. I don’t want the clothes to take over. I want them to complement what I have to say or my behavior. It’s a constant reminder of who I am, as well as whom I want to be. I kind of touched on that above, but I would say it would be a tie between how I feel at the time and the occasion for which I have to dress. With that said, in terms of what inspires my shopping choices, I would say quality and classic style. I take very good care of my things because I want to keep them forever. After all, everything comes back again! Body type is important because you need to know whether a particular silhouette will work for you. I wear a lot of shorts. In fact, I would say that 60% of my down time is spent wearing shorts. I’m much more a shorts person than a jeans person. Some people may say “But no one over 40 should wear shorts!” And to that, I say: “It depends”. If your legs can handle shorts, I say wear them to your heart’s content! But be honest and critical of your body in the sense of knowing what you can pull off and what you cannot, and then examine whether you feel good doing so. For example, I could probably pull off and micro-mini, but I don’t “feel” like doing so because I just don’t think it’s “me”. As for color profiling, I have never done so, but I do feel affinity for certain colors, and in my case they are: neutrals and jewel tones. I guess I’m very much about contrasts! Not at all, but then again, I’ve always been into classic styles. I think I explained that above. I strongly believe that your body follows your mind, and therefore, your state of mind and your life situation need to be factored into the definition of what “age appropriate” means to you. I am single, professional, no kids, etc., so the way I dress reflects my life situation, and my mental state at this time, quite well. When I was in college, for example, I would wear more jeans and shorts because that just fit that life stage better, but even then, whenever I had to host my television show, I would be the only college student dressed professionally on campus! Because of the blog, I would say that I am more aware about it, but I continue to be as interested in it as I have always been. Because it is who I am. Nevertheless, I don’t ever give it more importance than what it has. I like fashion and style for its artistic value, and for the opportunity it gives me to express myself, but at the end of the day, it’s an outfit, nothing more. I’m not a high-maintenance person at all. Probably the dressier ones because they’re more unusual and fun to come up with, but it’s hard to say. I have a special place in my heart for anything that my mother has made for me or anything that belonged to her. 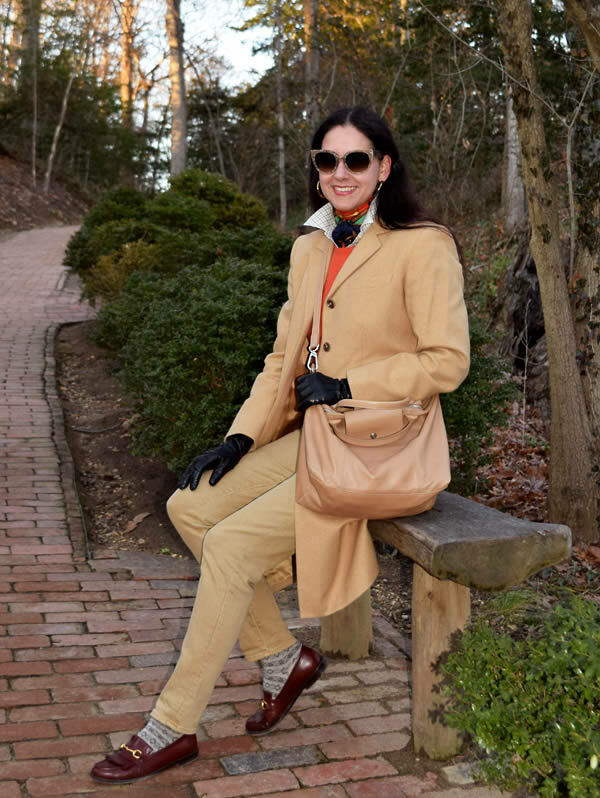 I also love wearing my vintage pieces and accessories because I love antiquing! I followed trends somewhat. I mean, I know what’s fashionable, but I don’t let that dictate what I wear. There are things that I have been wearing before they are fashionable and after they are no longer fashionable. If there is a trend I like, or one that works for me, I translate it to fit me, but if the trend means nothing to me, I happily ignore it! At the moment, I am quite excited with gingham being all the rage for Spring. I love gingham, and I have like a gazillion gingham-everything in my closet! It’s hard for me to say because it should be such a personal decision. I guess the only thing I would say is to wear quality, classic pieces. My blog continues to be a chronicle of my style, and I want it to continue being that. I have a job, so this is a side hobby that allows me to explore a passion I have. It would be great if I could develop it into a starting point for writing about style or even hosting media segments on the issue. We’ll see! A big THANK YOU! It’s been a wonderful honor and pleasure to share a bit of myself with you and your readers. I would also want to welcome anyone new that takes a peek and likes what they see, and of course, a big hug to all my loyal readers out there too! 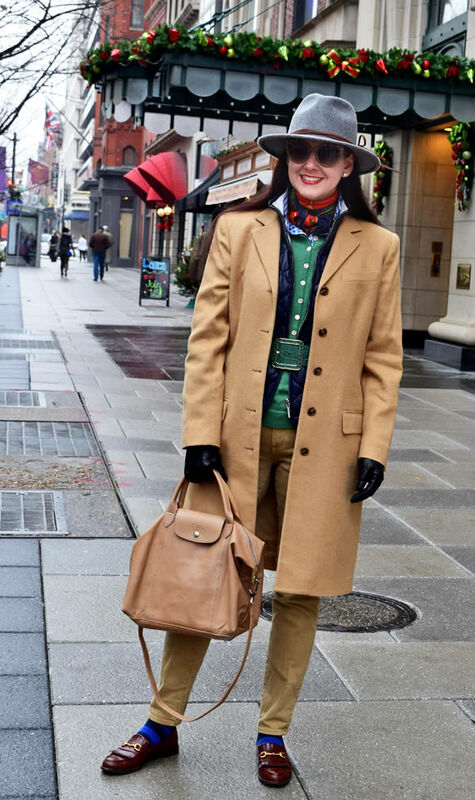 Be sure to check out Susana’s fabulous blog A key to the Armoire and enjoy many more outfits and descriptions of her creative processes! What is your creative process in creating your daily outfit? Which of Susana’s outfits is your favorite? Thanks for participating Susana! I know these questions do take some time…. I love this interview feature. I find the stories you tell of real woman and their relationship with style and fashion fascinating. I also get the huge benefit of being introduced to bloggers I might otherwise not find or get in contact with. This is a huge service and I greatly appreciate your hard work and diligence in discovering new and not so new bloggers and making them so visible. I love what Susana says about your “body following your mind” when it comes to style. She has a great look. Thanks Lyn. Great you enjoy the series. Like you I always find the answers and the different way women approach style fascinating to read. I must say, I’m also really enjoying your articles and the approach you have taken with your blog where you go deeper into the design process and the stories from individual designers and how the clothes or the themes of those clothes make you feel. Hello, I love Susanna’s style. Sylvia would it be possible in the process of your interviews to ask the height of the blogger? This really helps me to know if the style they are modeling might work for me. Lets face it you tall gals can get away with alot. You are so blessed . lol. Cheers! This is such a great series. Great interview and insight into her choices. She has a very unique sense of style. Thank you so much for featuring one of my favorite bloggers, Susana. I have been following her wonderful blog “A Key to the Armoire” for some time now. I am always amazed at how she pulls together such lovely, unique and perfectly appropriate outfits constantly. She is a stunning woman and worthy of being a style icon for all age groups. I truly appreciate the idea of being INNOVATIVE with your wardrobe. I think so many of us have the tendency to buy more items in order to have new outfits, when really it simply requires a fresh approach to what we already own. I clicked over onto Susana’s site and I will definitely have to start following her. I also like classics and have to dress for a profession where I have some freedoms but can’t get too quirky. AND I just got through saying to someone that I needed to read more in Spanish because I find my language skills slipping. Win, win! Me encanta saber que mi blog te va a ayudar a practicar tu castellano ademas de inspirarte a ser mas innovadora con tu armario! Another new blogger for me to check out and admire. Susana is beautiful, and expresses herself through style in an interesting and unique way. Love her focus on vintage and her reference to kindness. Great interview Sylvia! Wow, Susana is beautiful! She has a certain something to her person. An old worldness perhaps. I can see her being a Tango dancer. What a classic beauty! Love the way she dresses, too. It’s not 100% whimsical or classy but a mixture of both with more leaning on classical side. I can see her wearing Carolina Herrera, Ralph Lauren, and Oscar de la Renta. 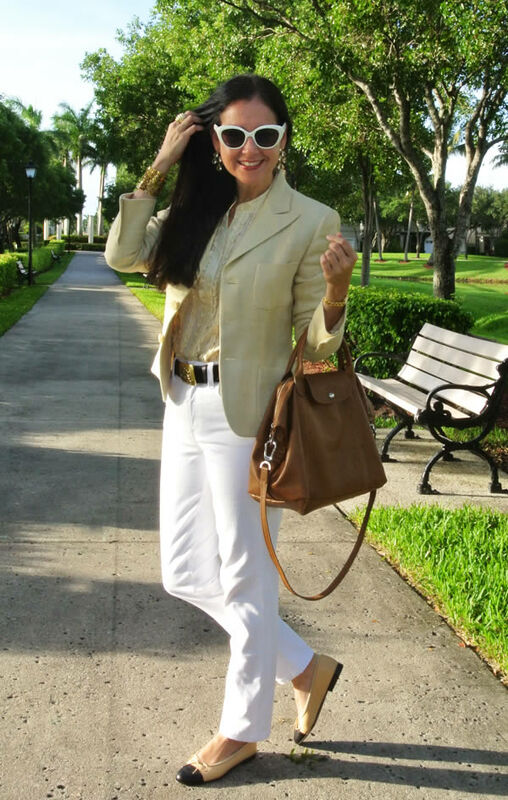 My favorite outfits : tan blazer with the white pants and black tipped flats … and the white lace top white skirt combo … Susana is classy, confident, and I love how she 1. owns her style 2. encourages others not to follow her style but to find their own. I wish you much success, Susana, thank you for featuring her, Sylvia. A very classy lady. Looking at her and her outfits I acknowledge the fact I am not a classy lady and I never will be either. Which is not bad or good, just good to know myself. Very inspiring, love all your clothes Susanna…. I loved this feature on Susana……it’s great to get an insight into someone’s creative process and I also love how someone who has a ‘classic’ style has managed to create some unique looks. Often ‘classic’ can be a bit predictable, but I think Susana has infused her personality into her style! Btw, My teenage daughters love your clothes too- super cool! Yes I will. We are currently living here in Qatar….right now window shopping. My daughters are looking for jackets-same like those you wore, ha,ha,ha. I now have three personal stylists – thanks again.